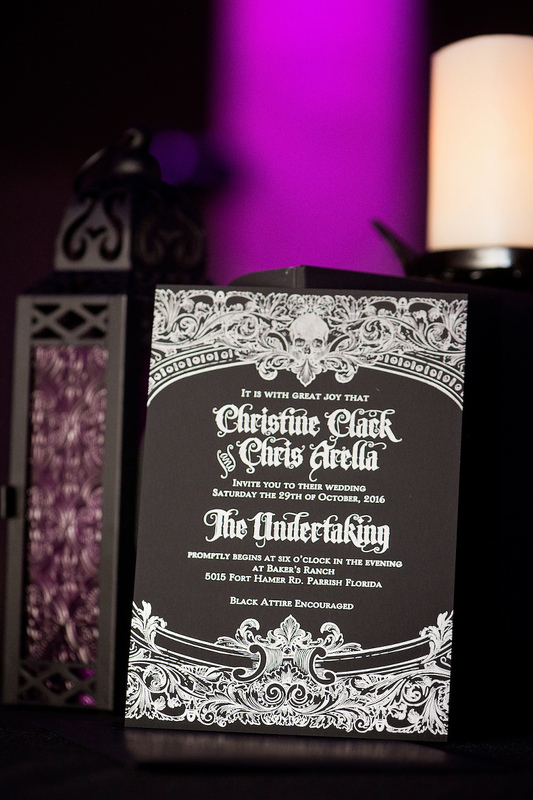 Christine and Chris’ frightfully romantic wedding featured a Halloween inspired theme and a bone chilling color palette of black, silver, grey, bone and white. The Clearwater couple wanted to hire the best wedding professionals, so they searched for a Sarasota wedding planner whom they could trust. The groom incorporated personal touches throughout the wedding with unique signage and custom GOBO lighting by Tampa Bay wedding DJ and lighting company Nature Coast Entertainment Services. Since the bride and groom chose to have an alcohol-free wedding, they knew they had to have a mouthwatering menu. “Amici’s Catered Cuisine was highly flexible and allowed us to put together a custom cocktail party menu that did not disappoint. The food quality was top-grade and staff was excellent,” the bride gushed. Looking back, Christine’s most memorable moment was being overwhelmed with emotion on her special day. “The ceremony was so warm, intimate and emotional. 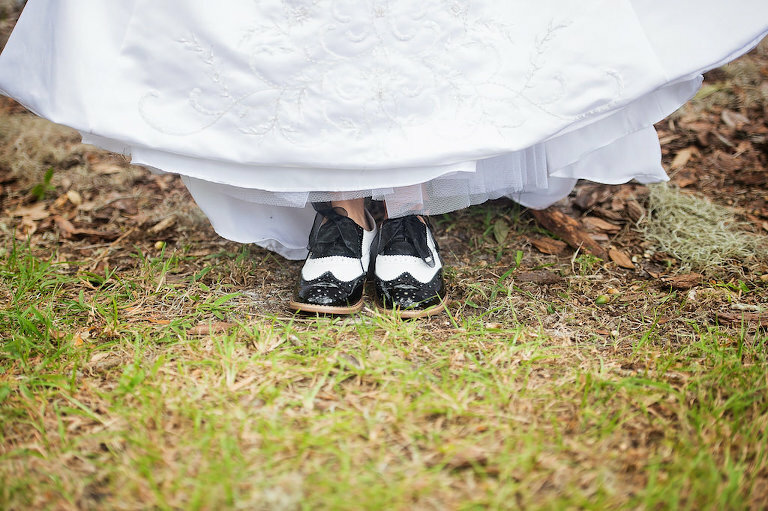 I don’t think there was a dry eye to be seen anywhere,” the bride reminisced. We love Halloween and haunts, so Chris took me to Savannah to visit the famous Bonaventure Cemetery and to go on a ghost tour (including the Midnight in the Garden of Good and Evil haunts!) On our second day there, he got down on one knee and proposed to me in front of the fountain in the center of Forsyth Park. 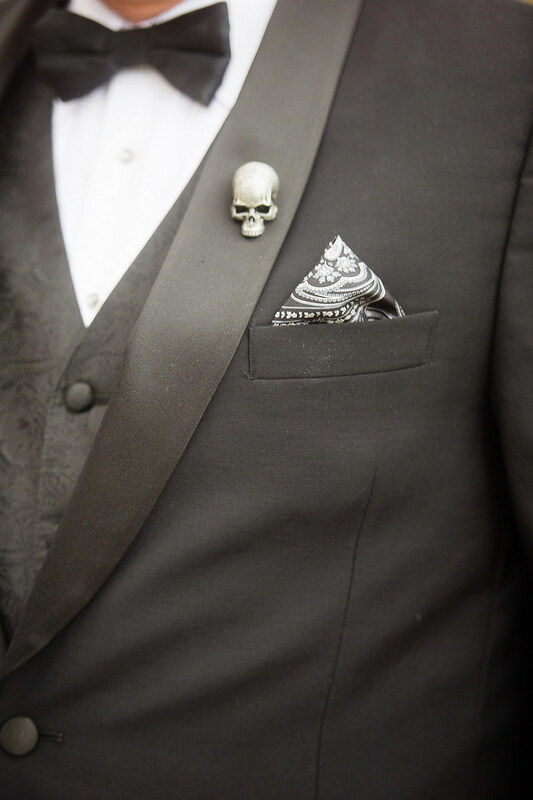 We wanted to have a halloween wedding, but that can be risky and that theme can go in many different directions. So our guiding principles were to plan a wedding that was fun, cohesive and sophisticated. 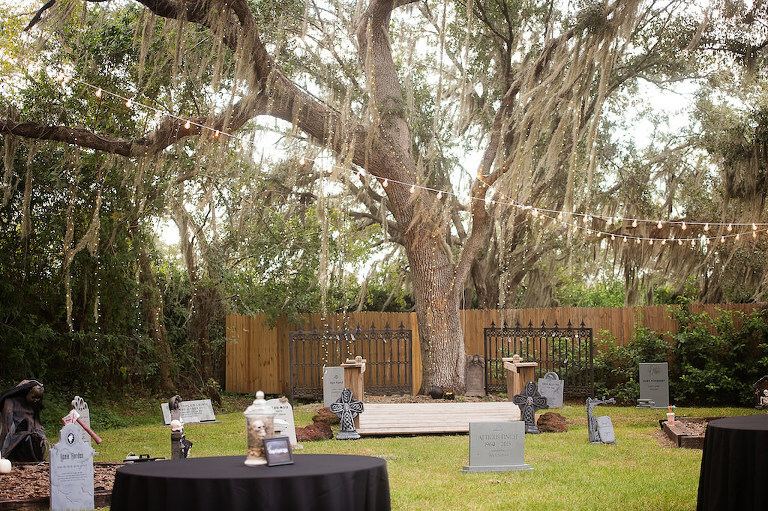 We chose a haunted cemetery for the ceremony and an Edgar Allen Poe theme for the reception. Nothing makes us scream and giggle like a good scare, so we decided to share that love with our family and friends. Black, silver, grey, bone and white. We saw a lot of gothic black and red weddings on Pinterest and didn’t want a typical orange and black halloween theme. Less color actually seemed more unique and it suited our theme. We hired Tammy [owner of Special Moments Event Planning] because she came highly recommended, and we had personally attended two weddings she planned prior to our own. She was recommended by several of our friends, who had used her with great success. Tammy then in turn recommended our DJ and caterer. After going to different wedding shows and tastings, we found Tammy’s recommendations to be spot on. We decided not to serve alcohol, so the food had to be fabulous. Amici’s Catered Cuisine came out on top. They were highly flexible and allowed us to put together a custom cocktail party menu that did not disappoint. The food quality was top-grade and staff was excellent. What did you look for in a wedding DJ/lighting specialist? Fun, experienced, creative, great equipment, happy customers and a beautiful lighting portfolio. We went to several wedding expos, but had a hard time selecting a DJ and lighting specialist. Our planner recommended Nature Coast Entertainment Services. Michael, the owner, was so enthusiastic, creative, energetic and amazing. The music and lighting set the perfect tone. It all came together in a beautifully balanced way that was quite unexpected. Make your wedding as unique as you are, put your heart into it, have fun with as much of the process as possible, and try not to stress about any of it. Above all else, get a great wedding planner! It will be the best money you will spend on your wedding and will alleviate so much stress.